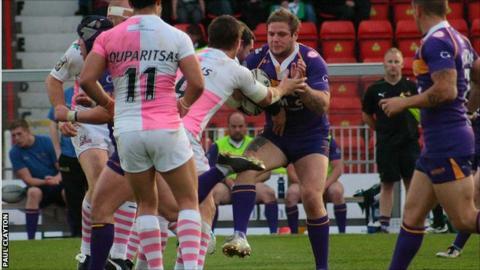 Gateshead Thunder captain Jason Payne has committed to the club for the 2013 Championship One season. The 24-year-old prop, who joined the club from Castleford on a permanent basis in 2008, was a regular last season, scoring five tries in 21 games. "This is a real statement of intent that we have been able to keep Jason at Gateshead," coach Kevin Neighbour said. "He's been outstanding for us over the past three seasons in what has been the toughest time in the clubs' history." Thunder ended a 64-match run without a win against promoted Workington Town in August, a bright note in a season that again saw the club struggle at the wrong end of the Championship One table. However the Scarborough-born forward continued to impress, and was named in the divisional team of the month for August as reward for his performances. "There have been several clubs looking to sign Jason for 2013," Neighbour added. "The fact that we have been able to retain his services for another year is a true mark of both him as a person and where he sees we can go next year."